When the exact phrase I used as the title of this article nets a whopping 749 results on Google, it’s easy to see that there must have been a misstep somewhere. Little Big Fail actually brings back over 1,200 results. The game is a genius concept and was one of the most anticipated titles of all of 2008. The Playstation 3 exclusive was being looked forward to by all of the critics as a family friendly game, a new approach to video games, and a nod to creative players everywhere. Instead the game became all about a controversial recall and Super Mario Bros. level remakes. I, myself, try not to buy in to the hype that surrounds games like this. If still have not seen the 2000 movie “Gladiator” because everyone said it was the best film I would ever see… I don’t like being letdown, nothing is ever as good as the hype. 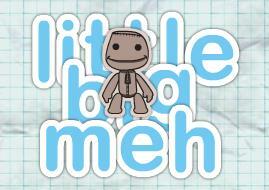 So I waited a while, passed up a few deals in the Sunday paper, and added LittleBigPlanet to my Goozex queue. After a little more waiting, the game finally arrived. The anticipation was over. I slapped the disc in… and waited. Evidently, I had been missing out on some 200+ megabytes worth of updates. So, once all of that was out of the way, I grabbed my controller and ran through a few tutorials, listened to the charming introduction and narrative that would follow me around. I completed tasks of varying difficulties, and unlocked the ability to play online (a feature I had yet to even look for, and hadn’t realized you had to play to unlock… quite a nuisance to other players, I’m sure). With a scoreboard that makes little to no sense and trophies that requires true dedication to the inhabitants of this LittleBigUniverse, I found myself not caring about that aspect of the game. Which leaves… traversing through some sort of afterthought storyline, or playing levels designed by amatures. Neither of which sounded appealing. And then I stopped. I have stopped playing. I added the game back in to my Goozex trade queue, and within hours have seen a request pop up. I will probably even be shipping the game out this weekend. A moment of silence to reflect. The base of the game is brilliant, lighting schemes, physics engine, the nearly limitless power to create… if you have the patience to work your analog stick and build everything in your world brick by brick. I did almost no level designing because my creativity doesn’t inspire me – other people’s does. I’m a writer, not an architect. As a kid, I got frustrated by Lego sets and G.I. Joe toys that had “some assembly required.” I built a desk upside down, once. I am not mechanically inclined. I wanted to see what the developers of the game could do – but evidently, beyond building a cool new engine with some fantastic texturing… not much. It’s like writing the world’s best novel with no main character, or the best painting ever of a bowl of fruit. It’s wonderful to look at, but not for long. There is nothing there to hold my interest, to keep me coming back. I am by no means the first person to think of this game as a let down, but for being one of the saviors of the Playstation 3, I force myself to think that these really are dark times for Sony. Well, there’s always Resistance 2 and Killzone 2. The Killzone 2 demo didn’t make me think it was anything ground breaking, but I will give the full game a better shot at some point. Resistance 2 is waiting for me at home (since before LBP arrived), and I should be diving in soon. Both of those games excite me more, not just because they are action and First Person Shooter titles – but because they have engaging storylines. It was a game that I was so anxious to play, and the fastest turnaround I have ever had for a game. I feel almost bad letting it go so soon, but I am comforted knowing that if I ever need my LittleBigFix, I can get a similar experience just by visiting the LittleBigPlanet website.